When I discovered a reboot of Godzilla was being made, it triggered a flashback. 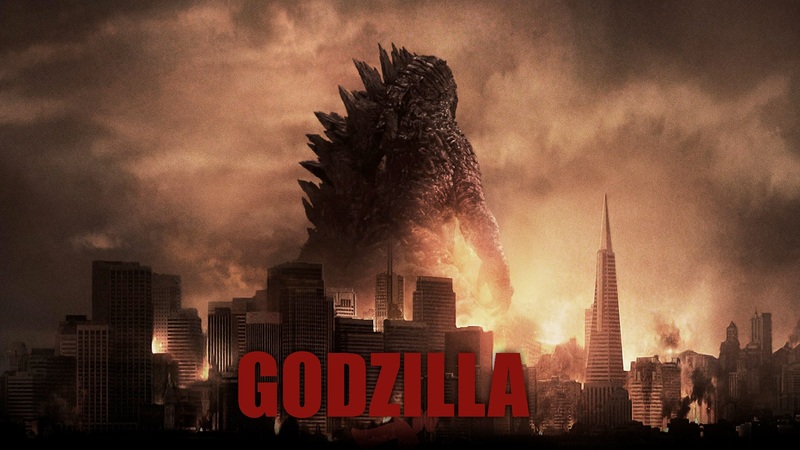 Suppressed memories of that wretched movie Roland Emmerich sold as “Godzilla” resurfaced. I recalled the childish Siskel and Ebert insults, the scientist testing an asexual mutated lizard with home pregnancy tests, the Puff Daddy theme song, it was awful. That’s the first Godzilla movie I’d ever seen in theaters, so upon discovering there was soon to be another, I groaned in disappointment. Then I realized there’s no way this new movie could possibly be worse than that 1998 atrocity, and kept an open mind. I’ve seen the last half of the American black and white classic Godzilla, as well as clips and segments from various Japanese movies, like Godzilla vs. Space Godzilla. So I am familiar with the lore and have come to expect certain things. This was my first opportunity to see Godzilla in 3D, so I ponied up a couple extra bucks for the 3D, since it was a cheap matinee show during the week. This is how I go to movies, middle of the day, middle of the week. There’s only ever like 11 people there so you can chat with friends without being shushed by the people around you. At this point someone seeing Godzilla outta know what it’s basically about. I don’t feel like I’ll be giving anything away but I’ll try not to spoil the few pleasant surprises the movie has. 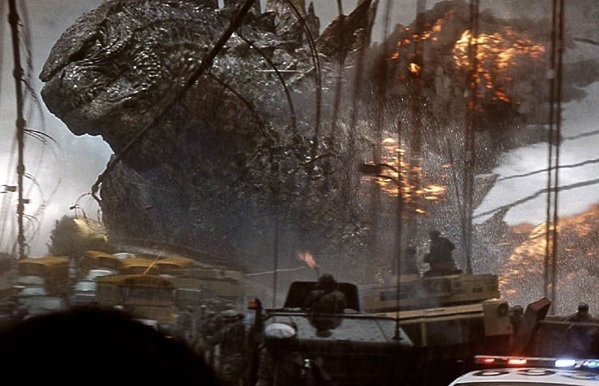 This incarnation of Godzilla has just enough awesome moments to pull you through the illogical nonsense that constitutes the bulk of the film. Like any good monster movie Godzilla starts out by addressing the problems of nuclear radiation. Bryan Cranston works at a Japanese nuclear power plant, his readouts indicate there’s trouble a coming. Who knew Bryon Cranston speaking intense Japanese would be so funny? His wife played by Juliette Binoche works there too. She’s in the wrong place when the shaking starts and they seal up her section to contain leaking radiation. She dies in the first 5 minutes, this movie coulda used more Juliette Binoche, hell most movies could. Having an earthquake cause a meltdown at a Japanese nuclear plant might cause people to grumble “too soon”. Remember it’s just a movie, at least there isn’t a tsunami sequence showing debris of cars, buildings, and people being washed up the coasts of Japan…that happens in Hawaii. Bryan Cranston sneaks back to the quarantined site decades later and learns that there’s a giant cocoon “feeding on radiation” in the remnants of the old plant. The scientist studying it cause it to hatch and a giant surprise comes out. Breaking Bad fans hoping for a showdown between Heisenberg and Godzilla better brace themselves. Cranston dies and with him goes the last interesting human character of the film, that’s okay this movie is about huge monsters. We’re left with Bryan’s grown son Ford (actual name) if you close your eyes Ford has the voice of an old lady. Ford is in the military which is fighting the monster, sort of. The whole way this movie handles the military is very confusing, they don’t know what to do about Godzilla and when they do it makes no sense. Nuclear bomb tests in the 50’s were actually failed attempts to kill Godzilla. The scientist now says a new monster called “Muto” is the real problem, Mutos feed on radiation and Godzilla preys on Mutos. It’s nature’s way of maintaining balance, that’s why we couldn’t kill Godzilla in the 50’s. So Navy ships are escorting Godzilla to intercept the Mutos, when they do the military plans to bomb all three at once, or something I don’t care about. I just want to see monsters destroying things. On the list of impossible things that would never happen, I do hope if there was some mythical creature that eats up radiation, humanity would have the good sense to not kill it. Instead the military plans to detonate a nuclear bomb to kill three radiation fueled beasts. I don’t know if the movie is trying to be funny with this ridiculousness, same goes for when Ford points his pistol at the 300 foot goliath staring him down, sure buddy that’ll stop it. The worst part is when Ford the “bomb specialist” can’t defuse his own bomb because of a piece of cracked glass mounted over the timer. Despite its many problems I still enjoyed Godzilla, here’s why. Godzilla stories are supposed to be over the top and silly. Godzilla is about destruction on an epic scale, we got that, especially since the monsters have their own special weaponry. Godzilla has got some really great suspenseful moments, the beginning scene in the nuclear plant kicks up the pace nice and early. There’s a great scene in Hawaii where Ford is on a train and the power goes out, after a while the lights come back on and Muto is on the tracks ahead of them, everybody is already panicking, then the train starts moving forward again, I thought “Here we go”. There’s just enough fun scenes that are so well put together, and look spectacular that it holds your attention through all the petty human drama. The real strength in this movie is that for all his power and terror Godzilla is who you cheer for. By the end I thought Godzilla was more like a big overgrown kid who didn’t know his own strength. The film only skipped two monster movie clichés I really wanted to see; Japanese people fleeing in horror yelling “Run, it’s Godzilla!”. And having a scientist look up, slowly take off his glasses, and dramatically say “My God”. Other than that Godzilla delivers everything you could want. My interest in Godzilla is renewed and am actually watching Godzilla vs. King Ghidorah on cable as I type this.